In the era of mega-trials, meta-analysis and outcome studies, the idea of writing case reports has been downplayed. Case reports still have a role to play in furthering medical knowledge and education. So much of the history of medicine is abound with case reports that have reshaped its course. Sir Edward Albert Sharpey-Schafer's study of the pancreas led him to the discovery of insulin. Banting and Best injected insulin into dogs, whose pancreases have been removed, and the animals’ blood sugar levels went down, they won a Nobel Prize. The erudite physician gets his name inscribed in history. Dr. Robert Graves in 1835 first described the condition caused by a generalized overactivity of the thyroid gland. Broca’s area, the speech production center in the brain, was named after Paul Pierre Broca who made this discovery while studying the brains of dysphasic patients. William MacIntyre and Henry Bence-Jones made history by recording the effect of multiple myeloma on a patient whose urine they described as “abound in animal matter.” In the Philippines, Rotor syndrome, also called Rotor type hyperbilirubinemia, is a rare, relatively benign autosomal recessive disorder; this case report was first published in 1948 in Acta Medica Philippina, and recognized worldwide with the publication of Wolpert and Pascasio in the American Journal of Medicine in 1976. 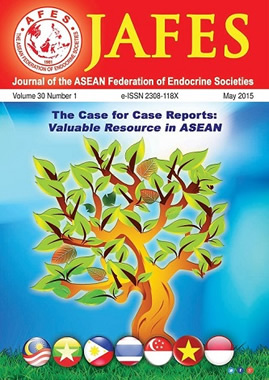 In this issue of JAFES, we continue to publish case reports which we know will impact our understanding of diseases as well as lead to the discovery of new methods of treating disorders.